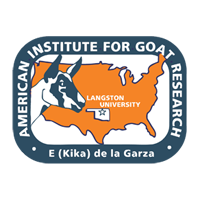 Forty-five weaned wether goats (12 Alpine, 12 Angora, 10 Boer [87.5%] and 11 Spanish) were used to determine effects on growth performance of consumption of a 75% concentrate diet (DM basis) for 24 wk (75C) or for 12 wk subsequent to 12 wk of feeding a 50% concentrate diet (50C). Initial BW was 20.2, 12.2, 20.7 and 19.2 kg (SE = 0.73) for Alpine, Angora, Boer and Spanish, respectively, and age was 4 months when the experiment began. There were no interactions between genotype and dietary treatment in DM intake, ADG or gain efficiency in wk 1-12 or 13-24. DM intake in wk 1-12 ranked Alpine and Boer > Spanish > Angora (703, 689, 567 and 436 g/day; P < 0.05) and in wk 13-24 was significantly greater for Alpine and Boer vs. Angora and Spanish (712, 702, 515 and 456 g/day; P < 0.05). DM intake was similar between dietary treatments. In wk 8, OM digestibility was 79.3 and 71.3% (SE = 1.57) and NDF digestibility was 54.2 and 52.1% (SE = 3.46) for 75C and 50C, respectively. Total VFA concentration was similar between diets; the acetate:propionate ratio was greater (P < 0.05) for 50C vs. 75C (4.12 vs. 2.56). ADG in wk 1-12 was greatest (P < 0.05) for Boer (59, 59, 90 and 49 g/day for Alpine, Angora, Boer and Spanish, respectively); in wk 13-24 ADG was lowest (P < 0.05) for Spanish (25 g/day) and tended to be greater (P < 0.10) for Boer vs. Alpine (82 vs. 58 and 63 g/day). Gain efficiency (ADG:DM intake) was greater (P < 0.05) for Angora and Boer than for Alpine and Spanish in wk 1-12 (132 and 127 vs. 85 and 85 g/kg), and in wk 13-24 was lower (P < 0.05) for Spanish than for Angora and Boer (80, 121, 104 and 51 g/kg for Alpine, Angora, Boer and Spanish, respectively). ADG and gain efficiency were greater (P < 0.05) for 75 vs. 50% dietary concentrate in wk 1-12 (ADG: 73 and 55 g/day; gain efficiency: 122 and 92 g/kg), and tended to be greater (P < 0.11) for 50C than for 75C in wk 13-24 (ADG: 49 and 65 g/day; gain efficiency: 77 and 101 g/kg for 75C and 50C, respectively). In conclusion, differences in growth performance among Alpine, Angora, Boer and Spanish wether goats were similar with 50 and 75% concentrate diets, and the genotypes responded similarly to the change in dietary concentrate level from 50 to 75%.